The Arch of Titus is a famous attraction in Rome, built by the Roman Emperor Domitian in 82 CE, in honor of the great military conquest of his older brother, Titus. Perhaps the most famous part of this arch is the depiction of Romans carrying various articles from Herod's Temple (such as the Golden Menorah), after the Fall of Jerusalem. Though nowadays the arch is colorless, it is likely it was once painted. What would the arch have looked like colored? And why did no one attempt to restore the color when it started to fade? Perhaps they did not want to honor the horrible person it was dedicated to? High resolution three-dimensional scans of the Menorah and the deification reliefs were made, and part of the Menorah relief was examined to determine whether any traces of paint decoration were preserved. A Breuckmann GmbH 3D scanner was used for the data capture. UV-VIS spectrometry was employed to detect color on the marble reliefs. Traces of yellow ochre were found on the arms and base of the Menorah. 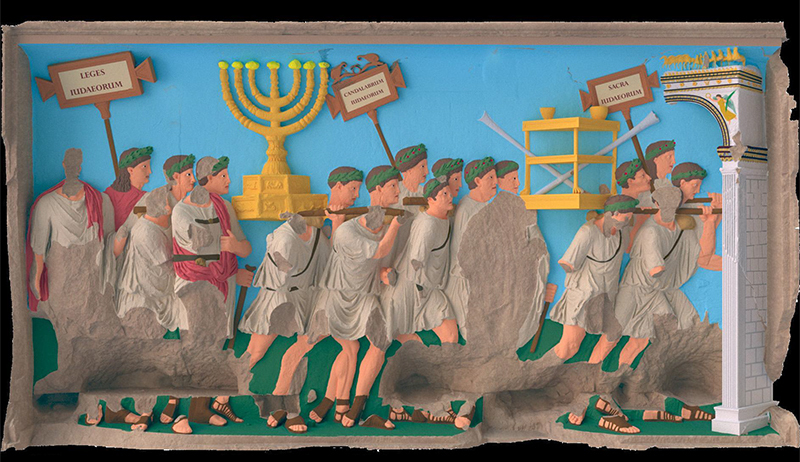 These results aligned with the Jewish historian Josephus’s account of the Roman victory parade, wherein he describes the menorah as being gold. The team then added color to the rest of the panel—bringing the ancient scene to life. They colored the background sky blue, the tunics off-white, the overgarments reddish-purple, the wreaths green, the laurel berries purple, the sacred vessels gold, the trumpets silver, and the leather and wood brown. They colored the arch (in the far right of the panel) white, black and gold. Further, they added labels to the three signs held by the Roman victors; these labels were based loosely on Josephus’s text. The intensity of the pigments as reconstructed is based upon the color value of the yellow ochre of the menorah, with none of the nuance that would have come with ﬁnal ﬁnishing and the the fading that comes with exposure to the sun... We colored the sky blue following the most common color for such things in wall paintings from Pompeii and Herculaneum. Since military tunics could be wool or linen, and are shown that way on the wall paintings, we decided on a shade of oﬀ-white - except for the overgarments, which we made a shade of reddish-purple worn by people of high status... The wreaths worn by the celebrants...are green, the color of the laurel leaves that compose them, while the laurel berries are purplish. We colored the skin and hair in Mediterranean shades, and the leather and wood in shades of brown. Pillows are shown that support the heavy menorah and the table...We colored them a slightly darker shade to contrast with the linen. The signs, tabulae ansatae, literally "horned tablets," are set in frames, which we colored bronze in contrast with the gold of the sacred vessels. On restoration, this was probably done for as long as the state could afford it or there were wealthy Romans looking to improve their reputation by paying for it. By the 4th century AD, though, the city and the economy were in serious decline. Wealthy Roman families either died out or moved to Constantinople, while the population declined from over a million during the 2nd century AD to around 30,000 in 550 AD. All this meant less city income from taxation and, inevitably, things began to fall apart as buildings were abandoned and money ran out. Titus's record among ancient historians stands as one of the most exemplary of any emperor. It is possible, though, that as Christianity spread in the late western empire, Titus' reputation suffered, but it was the early 19th century Pope Pius VII who initiated restoration work at that time. Although further research is ongoing, the ravages of time, the Arch's use as part of a medieval fortification and the 19th centruy restoration work have all contributed to some of the orginal stonework being lost, thus making it less likely that more colours will be detected by modern science. Not the answer you're looking for? Browse other questions tagged ancient-rome jews architecture jerusalem or ask your own question. When was Jerusalem destroyed by the Babylonians? What sovereign Jewish polities have existed outside of Palestine? What happened to the stuff stolen from the Temple in Jerusalem by the Romans? Did some Roman/Pompeiian houses have atria for slaves? What did Ostian script look like? What was it like for German Jews after WWII? Would every Roman army have dedicated engineers? What proof would a Roman patrician have of his status? 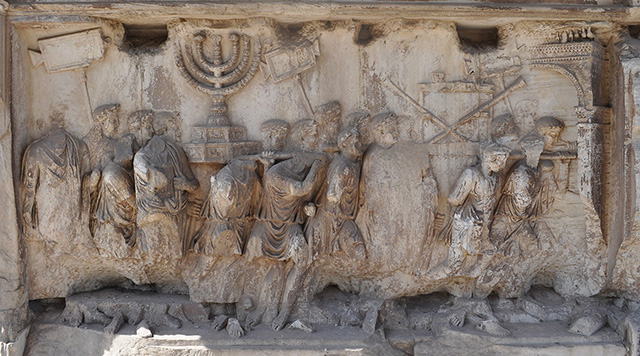 Why is the Arch of Titus not considered to be anti-Semitic?